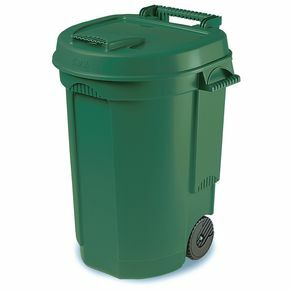 High quality, large capacity mobile bin. H x W x D: 910 x 590 x 610mm. Keeping your premises well maintained and clean is important, not only does it keep areas presentable for visitors but it is also more pleasant for employees. Our mobile refuse bin is a great addition to the workplace, allowing the user to easily transport the unit while litter picking or emptying smaller bins. These high quality large capacity mobile bins are easy to move thanks to the attached wheels. The user can simply pull the bin behind them or push it in front of them while moving around the workplace. There is a handle towards the back of the lid and handles on the side of the bin, providing plenty of areas for the user to grip on to. The dimensions are - H x W x D mm; 910 x 590 x 610 and they have a capacity of 110L. Our mobile refuse bins are a great way to easily collect litter and waste for disposal, while keeping your premises clear and they come with a 12 month guarantee.